For the past 29 years, South African theatre luminary Nicholas Ellenbogen has been churning out his Raiders series of comedy spoofs. A new one practically every year, which he then launches at the National Arts Festival in Grahamstown - where they have developed a massive cult following. This year’s edition is called Raiders of The Caribbean, and it was included on the bill of the Hilton Arts Festival in the KZN Midlands this year. 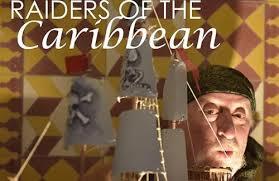 It is a hilarious, swashbuckling quirky rollercoaster of fun. The physical jokes, puns, comedy songs and slapstick come thick and fast, and without let up. It genuinely makes you laugh until you ache. The humour in many ways is reminiscent to the legendary BBC radio programme, The Goon Show which was created by the late Spike Milligan. The action is set in the 16th century and includes pirates, sailing ships, sword fights, dozens of ingenious props which turn from one thing into another, burning schooners, explosions and all sorts of other shenanigans. The irrepressible Ellenbogen plays a very elderly father whose lovely teenage daughter, Kitty (Jessica Sole), has run off to sea with Harry – an audience member is selected to play the role of Harry. The elderly father employs Kariba (Balindile Ngcobo) to find and rescue her. The resulting action is crazy, chaotic and hilarious to say the least. Jessica Sole plays all the female roles in the production with considerable panache. She is a fine comedy actress and seems to have a lot of fun on stage. The music for the show was created by Jonno Tait who also accompanies all the singing very competently on an acoustic guitar. He also played some of the bit roles. He is the perfect pirate with a big bushy beard. There is much audience participation during the course of the show with several members being selected to play characters. All of them entered into the spirit of the occasion and seemed to enjoy taking part. The only slight problem was with the sound system. Pirates shout a lot don’t they – "Arrrr!" - and as a result the system was often on the verge of distortion. This, however, is no fault of the wonderful production but rather a shortcoming of the sound system in use, or maybe operation thereof. Raiders of The Caribbean is pure, unadulterated comedy entertainment. It has no pretences to deeper or hidden messages. It is a huge cliché to say that something is suitable for all children under the age of 95, but in this case, it couldn’t be more true.